New Quay became the popular name for the village of Burrin after a new quay was built in the village in 1837. Aughinish Island, directly across the channel from the quay is part of the parish of New Quay but to reach it one must travel into Co. Galway. Both the Flaggy Shore and Lough Murree are rich wildlife habitats; Lough Murree being a freshwater lake within metres of the sea. ‘The Flaggy Shore’ is celebrated in a poem by Seamus Heaney. 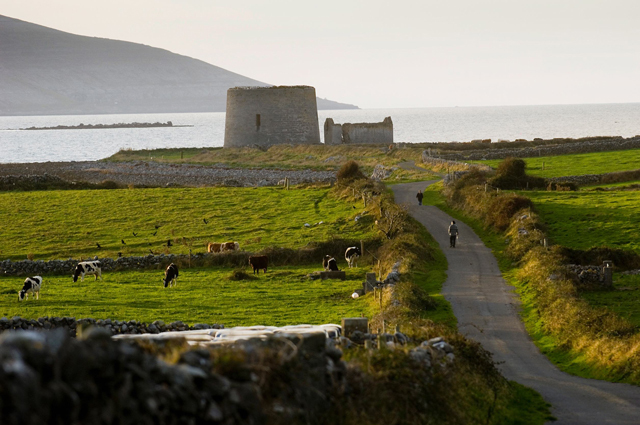 The area is rich in history with two late 18th century Martello towers; one on Finavarra Point and one on Aughinish island. Nowadays the village is a favourite stopping place for visitors, hoping to sample delicious seafood at Linnane’s Lobster Bar, enjoying home-made ice-cream at Linnalla’s Ice Cream Café and visiting the Russell Art Gallery. "We invite you to join us and get involved in our Burren food story. We are passionate about our food, growing and producing it locally for you to enjoy." The fertile valleys of the Burren have long been known for their quality food produce. In recent years, this food tradition has expanded through the emergence of many award-winning chef-led restaurants and high quality artisan food producers, as well as an increase in practising market gardeners and growers. The Flaggy Shore is a Geosite. 'Strewn with rocks from far away places, this shoreline provides several clues to the movement of ancient ice sheets across the Burren landscape. Pink coloured granite rocks from Connemara to the north and purple sandstone rocks from the Slieve Aughty Mountains to the east; share the shoreline with the native grey limestone rocks of the Burren. MINIMUM GEAR: Walking boots, raingear, fluid, mobile phone. Real ice-cream made here on our farm. Great range of light snacks, mouthwatering desserts, muffins and cakes, fresh milkshakes and smoothies. Linnane's Bar is set in a beautiful location in the heart of County Clare, on New Quay Pier overlooking the sea and Aughinish Island at the back the with a view of the Burren landscape to the front. Restaurant open each day @ 12.30 p.m.
Artisan Ice Cream free from artificial colouring, flavours, gluten, eggs or preservatives. Relax in our Café or take-away. Member of Burren Ecotourism who offer authentic experiences and promote the Burren Geopark as a leading sustainable visitor destination, celebrated for high standards in visitor experience, conservation & learning.